The town of Kent is located in Connecticut’s northwestern county, Litchfield, and shares its western border with New York State. Incorporated in 1739, Kent was once a thriving iron ore producer and farming community. Today, the town is a rural residential community with many small neighborhoods, including Flanders, the Cobble, and Bulls Bridge. The latter takes its name from one of the state’s last covered bridges. Built in 1842, the one-lane Bull’s Bridge features a lattice truss design patented by architect and engineer, Ithiel Town. The bridge, which spans the Housatonic River, was once part of a major highway from Hartford to Newburgh, New York on the Hudson River. “Connecticut Museum of Mining and Mineral Science,” 2012. Link. “Kent Falls State Park.” Department of Energy & Environmental Protection, 2012. Link. “Kent Historical Society,” 2012. Link. “Lake Waramaug State Park.” Department of Energy & Environmental Protection, 2012. Link. 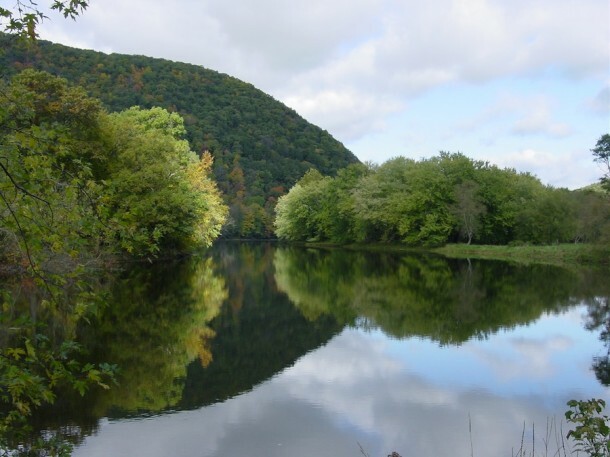 “Macedonia Brook State Park.” Department of Energy & Environmental Protection, 2012. Link. “Sloane Stanley Museum.” Department of Economic & Community Development, 2012. Link. “WPA Architectural Survey.” Connecticut State Library Digital Collections, 2014. Link. Atwater, Francis. History of Kent, Connecticut: Including Biographical Sketches of Many of Its Present or Former Inhabitants: 1897. Meriden, CT: Journal Publishing Company, 1897. Link.